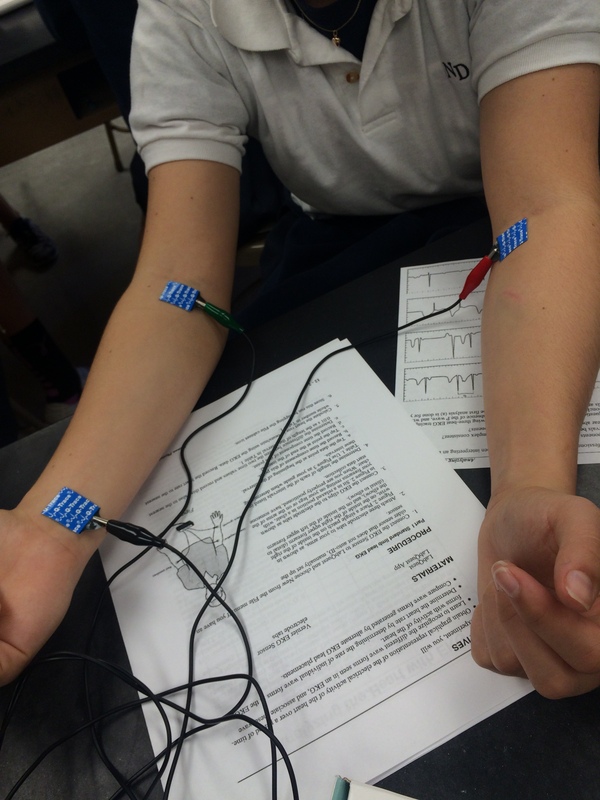 Our class got together in groups and performed the EKG lab. An EKG, also known as an electrocardiograph, is what we used to express the heart beats of each student chosen in our group. In my group’s case, we had Meaghan volunteer. Each of meaghans heart beats were separated and labeled into five different parts; P, Q, R, S and T. These separate parts are what the data was to be found. The first thing our group did was grab science computers and launched LabQuest. This is a program on the computers that connects to EKG sensors, which Sophia and I placed in three different parts of Meaghan’s arms. We first took note of her simple heart beat, at rest. After we received the data of Meaghan’s heart at rest, we switched her red and green sensors attached to her arms to create a mock heart attack. We took a screenshot of that data. After looking at both graphs, a normal heartbeat and then one having a heart attack, it is very easy to note the first obvious fact; waves R and T go in the opposite direction with the one having a heart attack. It is very easy to tell which is a normal beat and which is not. After looking over all of the information and taking note of all of the data above, it is very easy to note which is a normal heart beat, and which is abnormal. It is all about the wave patterns. After looking at the beginning and end times, you could not that all of the waves are connected in order going down the list. This lab taught us how to use EKG’s and how to measure heart rate, and how to to determine which is normal and which is abnormal, for example a heart attack.